Over the last couple of weeks I've used Twitter to ask for user recommendations on Hungarian, Recipe, and World Cup apps. It seemed unfair to keep the results to myself. I also recently had the pleasure of working with a Apps for Good, a program from CDI Europe that teaches young people how to create apps that change the world - a philosophy I could not possibly agree with more. The class I was involved with recently graduated, and published 3 new apps to the Android Market in the process. So, for your enjoyment (and with limited commentary) here are some of the apps I've been checking out recently. Stop and Search: Really useful reference app that walks you through your rights and obligations when you're stopped by the police in the UK. Bonus points for providing a mechanism for rating and mapping the experience, as well as viewing a map of other reported stops. StudioPhly: For aspiring musicians, this app will let you find a local recording studio with the gear you need. StudentVoice: Lets prospective students find out more about the prospective Universities. VibraSeq (by A-Droid): Love this. A sequencer to create complex device vibration patterns. But wait! You can export the recorded vibration patters for use in 3rd party apps that support them. Names (by Elek, Márton): Simple widget that tells you what Hungarian name day it is. Bonus points for searching your contacts and triggering notifications to remind you of anyone's name day. GPS Status (by EclipSim): There's a few apps out there that will show you the position, strength, and details from the GPS - but from what I've seen this is the best of them. Nice UI, lots of information, perfect for the data obsessives amongst us. Cooking Capsules (by Smart Capsules): Recipes + shopping list + video of the recipe being made. An ADC1 winner, it's an oldie but a very goodie. Epicurious (by Condé Nast Digital): This seemed a popular choice, and with 28,000 recipes I can see why. Goal.com Mobile (by Handmark): Live scores, breaking news, good stuff. World Cup News Pro (by Mippin): All the World Cup news for all the teams you follow, presented in Mippin's familiar flip-card UI. Sun Football (by News International): Live scores, highlight videos, and world cup news from The Sun newspaper. I'm Reto Meier, I work for Google as the Tech Lead on the Android Developer Relations team. 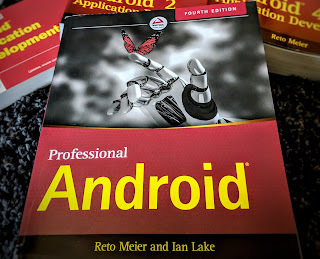 I'm also the author of Professional Android 4th Edition. This blog covers technology and programming - particularly Android - but this is my personal blog. The views expressed on these pages are mine alone and not those of my employer. Google I/O Session Videos Available Now! What Do YOU Think Fragmentation is?